It is a common practice in Hollywood to save Oscar-worthy films and release them at the end of the year, where they will be fresh in the minds of voting members of the Academy. That’s why there is always a proliferation of personal dramas and epic undertakings crowding theaters the last two weeks of December. “Hilary and Jackie” doesn’t even open in theaters until December 30, yet in my opinion it is one of the best films of the year. It comes with all the obvious Oscar trappings: two strong female characters, accomplished writing and direction, it’s a period piece that spans four decades, and it’s British. It stars the vivacious Emily Watson, whose knock-out performance in her film debut, “Breaking the Waves,” garnered her an Oscar nomination. Watson should be able to cash in on that promise with her brilliant performance in “Hilary and Jackie,” a tough yet engaging tour de force that should not only net her another Best Actress nomination, but the award itself. 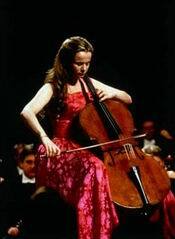 Watson is simply mesmerizing as real-life, world class cellist Jacqueline du Pre, whose turbulent life is captured with love and respect in Frank Cottrell Boyce’s sympathetic screenplay. Based on Hilary and Piers Du Pre’s book “A Genius in the Family,” Boyce’s screenplay is thoughtful and honest. It captures both the light and dark sides of life with aplomb. Under the assured direction of Anand Tucker, making his debut, “Hilary and Jackie” is a film filled with passion and torment, hope and despair. Most of all, it explores the fragile composition of the human condition with a refreshing honesty that may be hard to take. Shot in gorgeous amber strokes by director of photography David Johnson, “Hilary and Jackie” begins with one of those magical moments that set the tone for the rest of the film. As children, Hilary (Keely Flanders) and Jackie (Auriol Evans) are innocently playing on the beach when they come across a woman standing by the shoreline. Jackie wanders over to the woman, whom we never see up close, and then returns to an anxiously waiting Hilary. When Hilary asks what the woman said, Jackie leans over and whispers in to her ear. After a word of assurance from Hilary, the girls are off playing again, carefree to the world. This little passage shows us how close these two sisters are. Even in the middle of a deserted beach, a secret is something you only share with your sister, not the rest of the world. It’s a bond that will be tested numerous times before “Hilary and Jackie” comes to a conclusion. Through the encouragement of their mother (Celia Imrie) and father (Charles Dance), the girls have become young musical prodigies. Hilary is a brilliant flutist, while Jackie displays the same promise on the cello. When Hilary is picked to perform on a BBC production without Jackie, Jackie is heartbroken and vows to become the best cellist in the world. After years of studying and hard practice, Jackie fulfills her dream, and becomes a renowned musician, touring Europe and Russia. Hilary ends up marrying and raising a family, putting her musical aspirations on hold. When Jackie marries famous conductor Daniel Barenboim (James Frain), it seems both women have found the inner peace they have been seeking. Then something rocks Jackie’s boat, and she winds up at Hilary’s country farmhouse. Jackie’s arrival allows screenwriter to dissect the film in half, examining the events leading up to this moment from both Hilary and Jackie’s perspective. Hilary’s side is presented first, allowing us and Hilary to remain in the dark as to Jackie’s aberrant behavior. Incoherent at times, Jackie arrives as a woman on the brink of madness. Just what brought her to this ledge is examined in Jackie’s story. On the surface it would be easy to classify “Hilary and Jackie” as another “Shine” or Lifetime Disease Movie of the Week. The film deals with the effects of multiple sclerosis, but it’s not about MS. It’s about two sisters whose love for each other transcends all bounds, and the sacrifices they’re willing to make for each other. In the less flashy role of Hilary, Rachel Griffiths, the marvelous Australian actress, excels. Griffiths more than holds her own, delivering a convincing performance that just melts your heart. There’s underlying strength in every ounce of Griffiths performance. You completely understand her motives and reasoning. David Morrissey and James Frain are excellent as the men in Hilary and Jackie’s lives, while Celia Imrie stands out as the stage mother who knows her little girls are geniuses. “Hilary and Jackie” lives and breathes on it’s musical performances, and the actresses (with assist from Cello soloist Caroline Dale) do a splendid job of making us believe they’re the ones striking up the band. The original music by Barrington Pheloung expands on the themes and helps create a classical mood. Production designer Alice Normington is to be commended for creating so much from so little, recreating four decades of several countries on an independent film budget. Her work is so seamless you never suspect for a moment that you’ve been tricked. Director Anand Tucker is also to be celebrated for his auspicious debut. Tucker shows real skill for handling strong, adult material. His instincts as a director are first rate, and the results show in every frame of the film. “Hilary and Jackie” won’t be visiting your neighborhood until next year, but when they do arrive, make time to spend two hours with these two wonderfully engaging and emotionally satisfying women. You’ll be glad you did. This entry was posted on Monday, May 24th, 1999 at 11:50 pm	and is filed under Film Review. You can follow any responses to this entry through the RSS 2.0 feed. Both comments and pings are currently closed.